Then God commanded 'Let lights appear in the sky to separate day from night'. 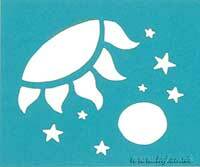 A small laser cut card in a light weight dark coloured card with a scene of Sun and Moon in the star filled Heavens cut out. The folded card is 105mm wide by 90mm high.